Even though I am always drawn to bright and airy spaces, I have recently been experimenting with darker, moodier colors. 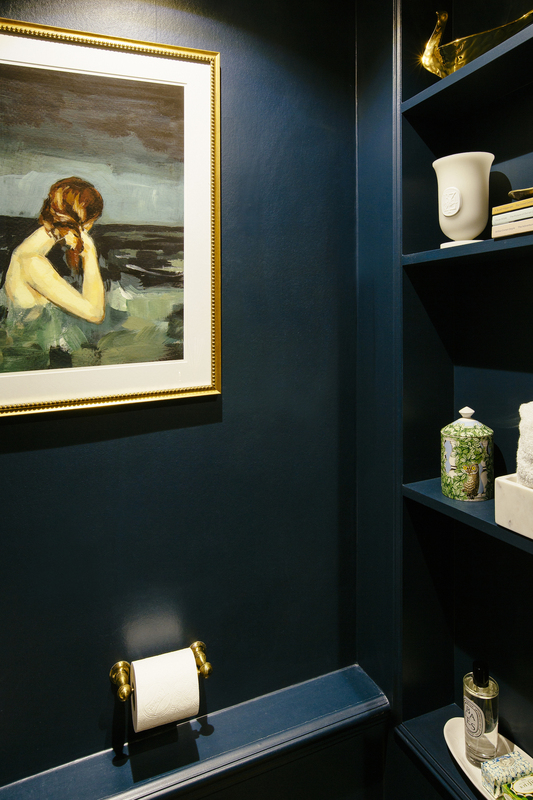 When I was re-styling my client’s very small powder room, we kept coming back to Farrow and Ball’s Hague Blue. This hue is so deep and a really strong statement color. I normally see this shade used in living rooms or painted on classic shelving, but we decided to go for it in this very tiny space. To be honest, I was a bit nervous with this one, I had never gone so dark in color in such a small room. I wanted to share the outcome of this space. It literally transformed the bathroom. The only other items we did here was some shelf styling and adding a brass frame to the painterly art print. I hope this inspires you to take a chance and go for something bold (even if you are decorating a smaller space). You might be surprised at how much you love it. 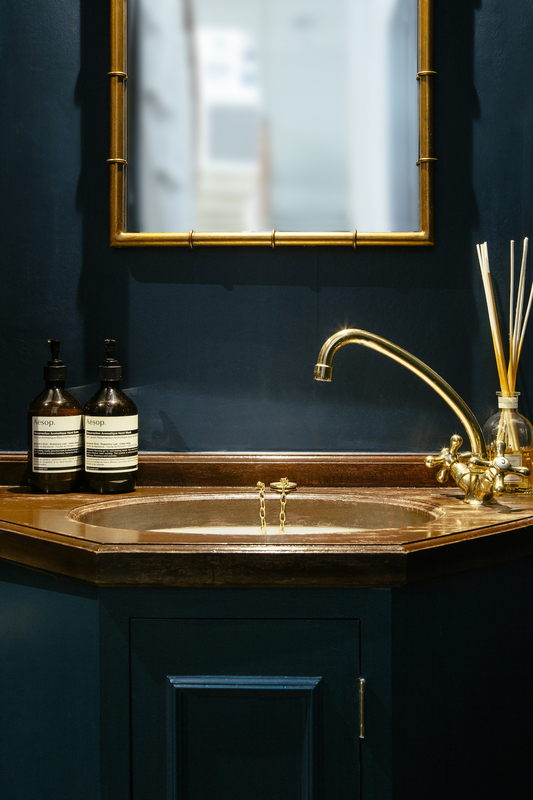 Farrow & Ball’s Hague Blue made the wood and brass accents pop! Such a beautiful contrast. I also added a brass frame to this Clare Elsaesser art print. It made all the difference. 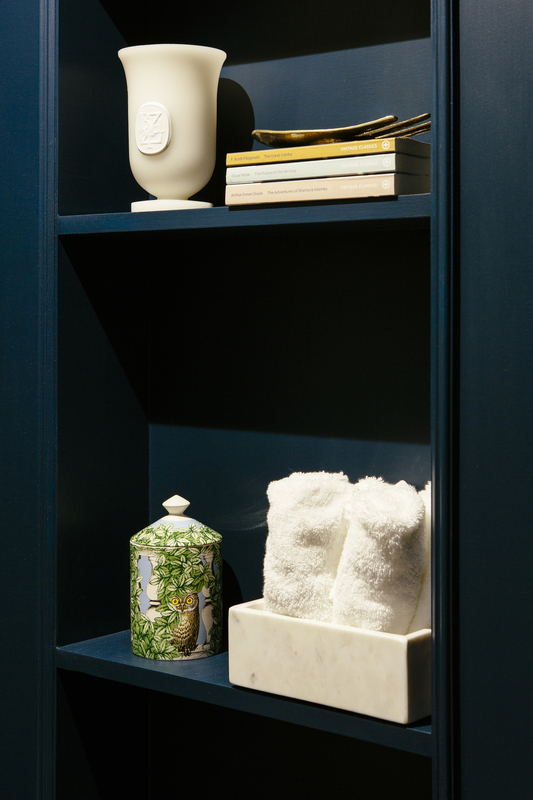 I styled the shelving with simple candles (Fornasetti & Diptyche), along with books, hand towels and minimal brass objects. Awesome Post.Thanks for Sharing with us!! !